Welcome to the Dyson complaints department brought to you by HissingKitty. Experienced poor customer service? We make it easy to file a formal complaint against Dyson online. Simply use our free form and your feedback will be instantly forwarded for review. Need to contact the Dyson corporate office? We have the mailing address, phone number, and email address listed below. A Dyson vacuum was to be delivered to us as soon we returned the under preforming to you. This well over a week what is causing the delay? I have called Dyson 15 times or more for some filters for my cyclone v10. I reordered the same air filters 3-4 days ago, only to be told they will not have a tracking number for a least 5 to 7 days.. There is not a place that I have ordered something that I don't get a tracking number for UPS immediately. if you give the customer the UPS tracking number, not waiting for the postal number. that is ridiculous . do you realize how many more phone call you receive because of it. We Have Purchased Three dyson hand held Hoover Products over the last Three Years, and each one has proven to be a Dissapointment Apart From being A Fundamental Really Good Product They have not had enough Testing before being Sold. Each one has not been fit for Purpose. I placed an order for a hair dryer to be sent to my mom for her birthday. After placing the order and my card being charged/money held. I received an email stating my order did not go through. I called their customer service line. Spoke to 2 different support agents. Received a bunch of words and empty promises. I offered to be called to give a review each time but was never given the opportunity to rate them as they were aware it would not be a favorable one. Should not be allowed as they give false positive reviews this way. They seem to be a company built on poor service and questionable practices. I will not invest nor will I recommend them for anything in the future. Horrible business practice! Be careful they are worst then a teenager with excuses for poor behavior! I ordered a Dyson vacuum cleaner from Amazon on the 6th November and was told that it would arrive by the 29th November. It still hasn't arrived and despite numerous emails no one has bothered to answer me.I am a Senior Citizen and cannot afford to lose this money but as my emails are being ignored I don't know if Dyson will get delivered. Very disappointed in Amazon as I've shopped with them a lot in the past.I've also noticed that my emails are not in sent files any more. I purchased a Dyson V6 Slim Cordless Vacuum during Black Friday thru Walmart online store. I received a purchase confirmation within minutes after the purchase as well as an email telling me that the item would be ready for pickup at the store within the same day. The item was not available at the store when I went to pickup it up the following day. So I contacted customer service today (11/26) and chatted with attendant Maria M.
She assured everything was ok with my purchase and that my item would be ready for pickup today Saturday (11/26). 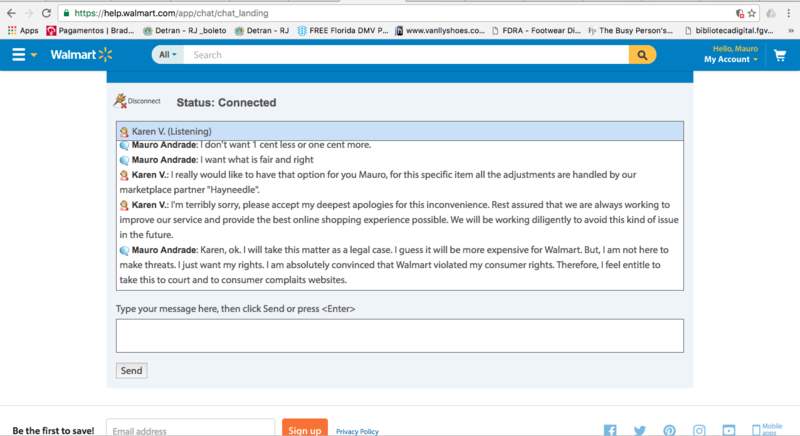 As a surprise I received an email from Walmart saying that my purchase was cancelled. I once again contacted Walmart thru online chat and attendant Jose T told me that the item was cancelled because it was out of stock. I replied that this was unacceptable practice and that Walmart has sold me an item and delivered my item to another customer or to someone else. He offered me to buy a totally different item at a higher price as a compensation for their 'mistake'. I rejected the offer. he than proceeded as to offer me a 10% discount on any purchase at Walmart. I told him that this was once again unacceptable and the the discount I had on my item was at 35%. I even mentioned that a very similar item is being offered at the online store and I would be more than pleased to buy the similar item at the same price I had purchased the original price. After waiting for almost an hour, attendant Jose came back with no solution and with a rather automatic answer as to say that the Dyson item was 'unfortunately' out of stock. I did not settle for such answer. He than proceeded to forward our chat to supervisor Karen who had the same automatic answer as attendant Jose. She only added that it was not Walmart's fault because the item was being sold by a partner! What? I didn't by the item from any partner. I bought the item from Walmart. I have been escalated to attendant Whitley P. But no luck and the problem persists. This is clear consumer violation as well as false advertising as I understand. Stay away from Walmart. Wanted to return a dyson animal vacuum that was given as a gift vacuum didn't charge so had no gift receipt a manager by the name of nick in the la quinta office was so rude didn't try to help me I then called corporate they apologized for his behavior and said he had no reason not to return it and give me a gift card. You should hire people who will work hard and make people come back to the store. I will never shop there or recommend no one there.